This year the showcase wasn't held at their offices – which was a shame for me as I work just a short walk away from them – but at The Coin Laundry on Exmouth Market. My old office used to be based around the corner from there and I was hit by nostalgia when I got near. I was surprised I hadn't been to The Coin Laundry before as it was a brilliant location and I will definitely be returning for a non-book event too. However, back to the much more important subject at hand: books ♥ There were some fab titles presented by the Walker YA team, but I won't bore you with in-depth comments on all of them, don't you worry. Instead, I'll highlight just the ones I'm most excited for to read this year and share with you all! I don't normally watch book trailers, but how cool does this one look?! While How to Hang a Witch is a contemporary teen read, the story is set in Salem (yes, the one from the Witch Trials) where protagonist Sam is caught up with The Descendants (a group of girls connected to those that were persecuted in the Trials), and a handsome ghost. This is a story that wouldn't look out of place on the CW (the TV channel that gave us shows like Supernatural, The Vampire Diaries, Riverdale and The Flash) and I'm all over it! In this novella, M.T. Anderson returns to the future Earth he created in his award-winning dystopian novel Feed. It's one I've actually not read just yet, but the description reminded me a little bit of a more action-packed Station Eleven by Emily St. John Mandel, which I absolutely adored, so I'm keen to check this one out for that reason alone. This one isn't entirely brand-new, having been released as a hardback in 2017, but I for one have not yet had a chance to pick it up so am keen to do so this year instead. Patrick Ness is of course a tour de force within the young adult market and few people need an introduction. This is the author of A Monster Calls and the Chaos Walking trilogy (the latter celebrates its 10th anniversary this year) and he always manages to make each of his novels wholly unique and unexpected. Release sounds like his most innovative and thrilling work yet. I had the true pleasure to hear Nat Luurtsema speak about her debut novel Girl Out of Water at the Walker Blogger's Showcase two years ago and I haven't stopped laughing since (well, almost). The sequel to the book sees us reunite with Lou, who's now coming back down from her brief stint of TV stardom and back into poverty (with lentils featuring in almost every meal, yikes!). But hey, at least Lou has a boyfriend now, right?! Full disclosure: I actually received a proof copy of this novel a few weeks ago and initially wasn't going to read it because when I read the blurb I thought it would be hitting a topic too close to home for me and I didn't want to read about that in a fictional escape. However, turned out I was wrong and this book is actually not about that. Pfew. Because it sounds amazing! We were super fortunate that author Tom Pollock was at the Walker Books YA evening himself to tell us all about his first YA novel and his self-depreciating humour and enthusiasm for math has me absolutely sold on this read. This is now my most anticipated book of the evening and I can't believe it's not out until June and I have to try and read books that are published sooner first. This one is going to be very hard to resist! Chaos Walking by Patrick Ness (1 February 2018). Not new, but Patrick Ness' critically acclaimed Chaos Walking series (The Knife of Never Letting Go, The Ask and the Answer, and Monster of Men) is 10-years-old this year and being re-released with smashin' new covers. I've not read these yet (although The Knife of Never Letting Go has been on my TBR for yonks) so that's something I need to rectify this year! The Wonder of Us by Kim Culbertson (3 May 2018). Trying to Tweet while watching the presentations I kind of missed this one on the night (oops), and so I only really came across it when reading the hand-out of new publications we'd received. It's a contemporary teen road trip adventure across Europe and sound like the perfect summer holiday read. On the Come Up by Angie Thomas (7 June 2018). I haven't read Angie's New York Times bestselling debut novel The Hate U Give (yes, I did live under a rock in 2017) but I have heard nothing but stellar things about it and her second novel sounds like an incredible follow-up. Set again in Garden Heights, this time around it tells the story of an aspiring teen rapper. Angie told us about it in a video and her passion for the subject shone through the screen (she was also very, very lovely about Walker, and can you blame her?). I promise I'll try to read THUG this year so I can read the second novel too. 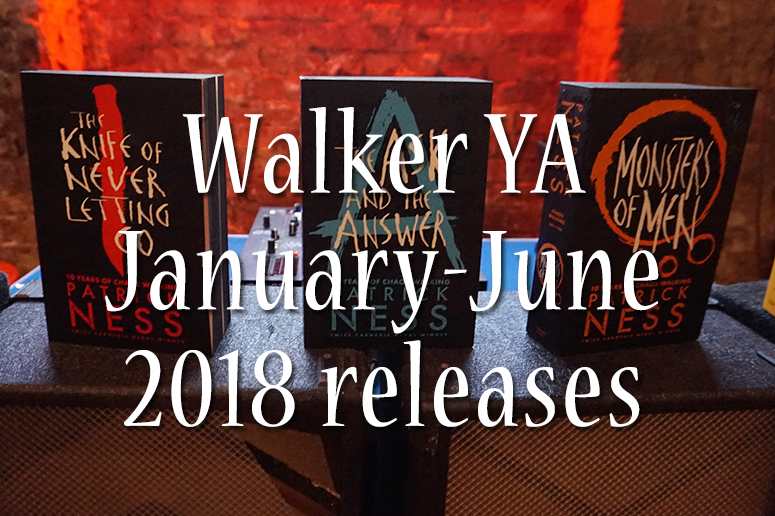 And that's it for my highlights of Walker YA's releases of the first half of 2018! Which of the above books are YOU most excited for? !